One Wasatch in its current form started as a distant dream more than 30 years ago. The idea was simple: take the seven central Wasatch ski areas (Alta, Brighton, Canyons, Deer Valley, Park City, Snowbird, and Solitude) — all standouts in their own right — and connect them via a series of chairlifts and ski runs. The combined ski experience would be one of the best in the world, at 18,000 acres, all of which would be accessible through one lift ticket. The proposal sounds complicated until you look at it on a map: the ski areas are already practically on top of each other. But it’s taken 30 years of starts and stops to see get where we are today, which is within easy reach. Already both Alta/Snowbird and Brighton/Solitude share lift tickets, allowing interconnected skiing between the resorts. After Vail Resort’s recent purchase of Park City —and their previous purchase of Canyons —those two resorts will be joined by next year, creating the largest ski area in the United States, at over 7,000 acres. The remaining resorts could be joined with three, relatively simple connections, creating the single largest ski experience in North America. Bigger isn’t always better, especially when you’re operating within the finite boundaries of Utah’s Wasatch Mountain Range, where snowmobilers, snowshoers, and backcountry skiers all seek their fair share of The Greatest Snow on Earth. But while One Wasatch is big — it would be twice as big as its nearest North American competitor, Whistler/Blackcomb (8,000 acres) — it’s the diversity of the experience that makes this concept worth completing. Wasatch is focused entirely on the ski experience. No development other than ski lifts and runs are part of the concept. Not hotels, no condos – just skiing. Another key component of the concept is that it can all be built on private land. Local residents understandably have their doubts. Fears about the region’s natural beauty, homogenizing the different resort experiences, and continued ski area expansion are major areas of concern. As always, change and uncertainty bring reticence, especially when it concerns Utah locals’ favorite pastime – powder skiing. From Alta’s laid-back attitude to Deer Valley’s service-first mantra, resort experiences at Utah’s seven central Wasatch resorts could hardly be more different. But having the ability to access these different resort cultures on one pass — whether it’s the personality of its guests, the makeup of the terrain, the architecture of its buildings, or the culinary experience at their lodges — would culminate into an experience much greater than the sum of its parts. For the Utah snow-sliding faithful, what once was a reluctance to change might soon become a healthy addiction. Straying just one ridgeline away from their regular powder stash would offer an entirely new experience. One Wasatch offers visitors and locals alike new vistas, runs, culinary experiences, and, perhaps most importantly, new chairlift conversations. Everyone would see an entirely different perspective. As locals, we’re programmed to head straight to our favorite lift, yo-yo up and down on a singularly focused powder-plundering mission for a couple hours and call it a day. 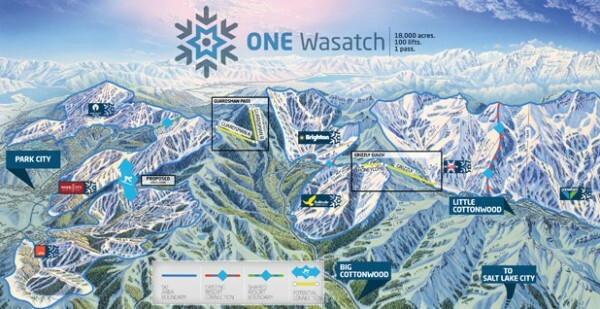 One Wasatch offers a different style of skiing altogether, where the value is placed on option. If it’s completed, we might wonder how we ever survived with just a single ski hill. Of course, destination skiers would enjoy the same benefits. And it might just entice them to add an extra day or two to their vacation to Utah. After all, seven distinct resorts is more than just a weekend’s worth of skiing.